A little over a year since launch, with its sights firmly on Jupiter, the New Horizons spacecraft is testing its science payload and making observations as it rounds the planet for a gravity-assist that will speed its journey to the edge of the solar system. As the spacecraft approaches the planet, the Solar Wind Around Pluto (SWAP) instrument is already generating data that will help resolve puzzling questions about the interactions between the solar wind, the million-mile-per-hour stream of ionized gas flowing out from the Sun, and Jupiter's magnetosphere, the magnetic bubble that surrounds the planet and encloses ionized gas. From a distance of about 0.4 astronomical unit (one AU is the distance from the Earth to the Sun, or about 100 million miles) from the planet, SWAP, built by Southwest Research Institute, observed an immense structure of compressed, dense, hot ionized gas that forms in the solar wind, called a co-rotating interaction region. These structures form when solar wind streams that are both fast and slow come out of the Sun, and flow out in different directions in response to the rotation of the Sun. The fast layers try to overtake the slow layers yet are unable to flow through them, instead compressing the slow material like a snow plow and bunching up solar wind to create the co-rotating interaction region. These regions contain significantly higher densities and pressures that eventually expand and form discontinuities, or shocks, in the solar wind, which spread out and away from the high pressure regions. "These solar wind structures collide with the magnetospheres of planets and, we believe, cause major variations in their structures," says Dr. David McComas, SWAP principal investigator and senior executive director of the SwRI Space Science and Engineering Division. "Because it has the largest magnetosphere in the solar system, the effects of the solar wind at Jupiter could have significant implications for all the planets." Studies of these interactions at Jupiter could help determine how much of the Jovian magnetosphere and aurora are driven by external processes, such as the solar wind, versus internal processes, such as planetary rotation. "There's an active debate about how much solar wind variability affects what magnetospheric responses we will see at Jupiter," McComas continues. "Except at Earth, we've never had the opportunity to simultaneously measure the interactions upstream of a planet as we're observing its aurora, but the Jupiter encounter will soon change that." The team is planning collaborative studies that will combine SWAP data with imaging and spectroscopic observations of Jupiter's aurora using the Hubble Space Telescope. The fusion of these data will result in the first simultaneous upstream observations of solar wind interactions at Jupiter as the aurora builds and subsides. "It's exciting that our approach to Jupiter is already yielding new insights to our particles and plasma science team. We're eagerly looking forward to sampling the plasma particle populations in Jupiter's bow shock and dusk-side magnetosphere later this month, and then exploring the terra incognita of Jupiter's deep magnetotail in March, April and May," says New Horizons mission Principal Investigator Dr. Alan Stern, also of SwRI. The Jupiter encounter also will enable SWAP to take measurements inside Jupiter's magnetosphere, on an orbit that has never before been traveled. That orbit will carry the spacecraft deep into the magnetotail, the portion of the magnetosphere that is pushed away from the Sun by the flowing solar wind. This route will provide the first close look at Jupiter's more distant magnetotail. Built to evaluate the solar wind's interaction with Pluto at about 30 AU from the Sun, SWAP's sensitivity was successfully decreased at Jupiter's relatively close distance of about 5 AU from the Sun to generate these early results. New Horizons is the first mission in NASA's New Frontiers program. The Johns Hopkins University Applied Physics Laboratory in Laurel, Md., manages the mission and operates the spacecraft for the NASA Science Mission Directorate. 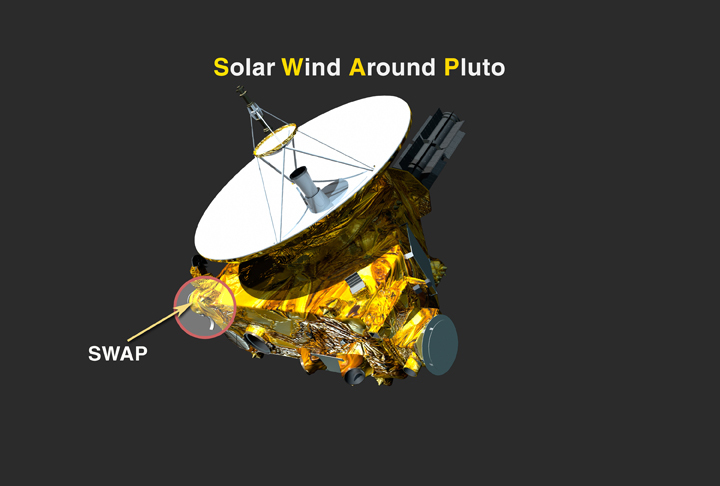 Southwest Research Institute leads the New Horizons science and mission teams from the Tombaugh Science Operations Center in Boulder, Colo.
From a Southwest Research Institute news release. For more information, contact Maria Martinez, mmartinez@swri.org.